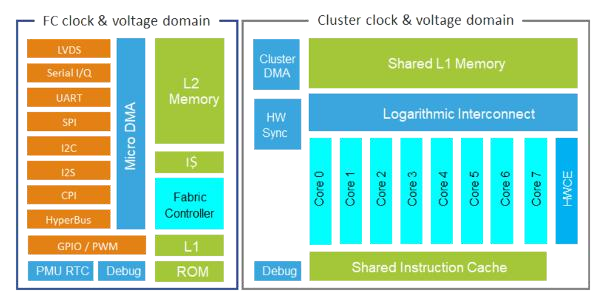 GreenWaves Technologies, a fabless semiconductor startup based in Grenoble, France, has designed GAP8 IoT application processor based on RISC-V architecture, and optimized for image and audio algorithms including convolutional neural network (CNN) inference with high energy efficiency thanks to an 8-core computational cluster combined with a convolution hardware accelerator. The design is based on RISC-V based Parallel Ultra Low Power (PULP) computing open-source platform. The new processor targets industrial and consumer products integrating artificial intelligence, and advanced classification such as image recognition, counting people and objects, machine health monitoring, home security, speech recognition, consumer robotics, wearables and smart toys. The processor is capable of delivering up to 8 GOPS at a few tens of mW, or up to 200 MOPS at 1 mW thanks to partially a cycle 5×5 convolution. The company compared the (theoretical) performance differences between GP8 to STM32H7 (Cortex M7) MCU for a CNN graph, and we can clearly see the massive advantage the new processor has for that particular tasks. 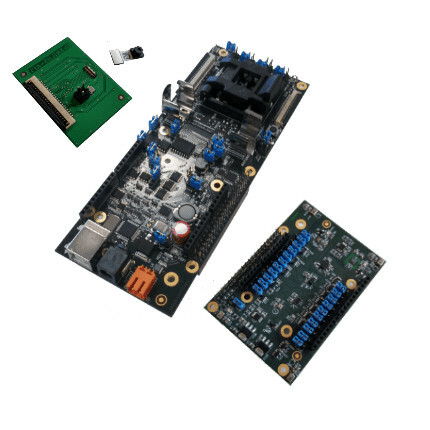 If GAP8 is configured to run at 15.4 MHz it can complete the task as fast as STM32 F7, but using only a fraction of the power, or run the task over 10 times faster when clocked at 175 MHz with a only slightly higher active power. Another way to look at power consumption, is the company’s claim that the processor can classify a QVGA image every three minutes for 10 years on a small 3.6 Wh battery. Cluster side development tools – GAP8 AutoTiler to generate C code to automate the movement of data between L2 or external memory. Code generators for the cluster – GAP8 Generator Library including different algorithms developed using the GAP8 AutoTiler. It includes CNN layers, FFT, Matrix Operations, FIR Filters, and more. You can find more details about the GAP8 processor, and/or pre-order the development kit (199 Euros) scheduled to ship in April 2018 on GreenWaves website. The company is also attending Embedded World in Germany at the RISC-V Foundation booth (Hall 3A, Booth 3A-419).